Researchers report a case of abdominal pain and hyperamylasemia due a duodenal foreign body in the September issue of Clinical Gastroenterology and Hepatology. 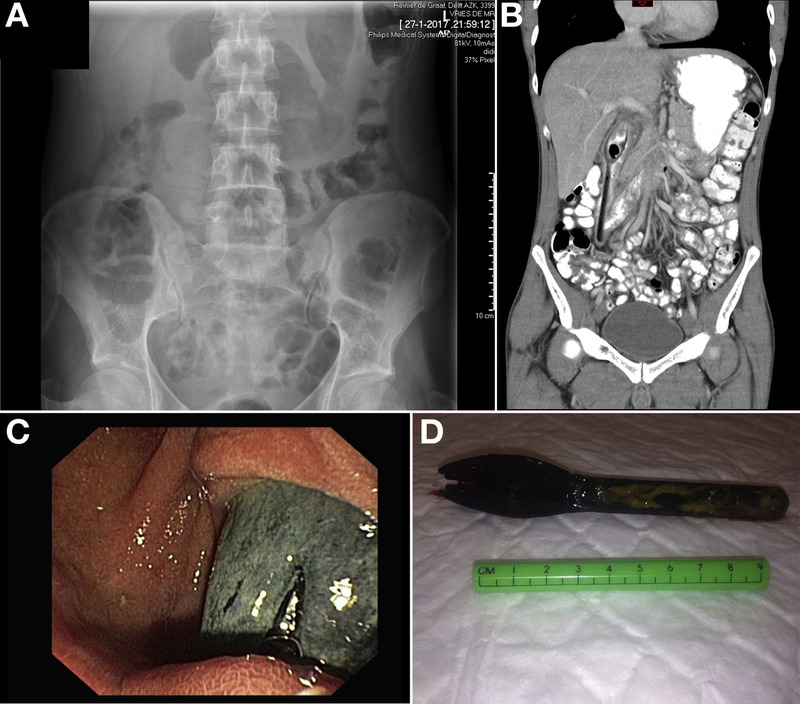 Lotje Korteweg et al describe the case of a 38-year old man referred for endoscopic retrograde cholangiopancreatography. A gastroduodenoscopy had been performed for chronic dyspepsia and showed a foreign body in the duodenum that was considered to be an endoprothesis in either the pancreas or biliary tract. The patient had previous hospital admissions for dyspepsia, and laboratory tests showed an increased level of amylase level of (575 U/L), but the patient had repeatedly left the hospital before further imaging analyses could be performed. An abdominal radiograph did not show any endoprothesis in the pancreas or biliary tract, but a repeated gastroduodenoscopy showed a large plastic fork or spoon in the second part of the duodenum (see figure), which could not be mobilized into the stomach by endoscopy. Computed tomography ruled out perforation of the duodenal wall and a laparoscopy was performed. The object was mobilized into the stomach and removed by gastrotomy, and the patient’s abdominal complaints disappeared. Korteweg et al conclude that for patients with abdominal complaints and hyperamylasemia (besides acute pancreatitis, severe gastroenteritis, or acute liver failure with renal dysfunction), a duodenal foreign body should be considered—especially for patients with a psychiatric comorbidity.